Dead of Summer TV show on Freeform: season 2 or cancel? 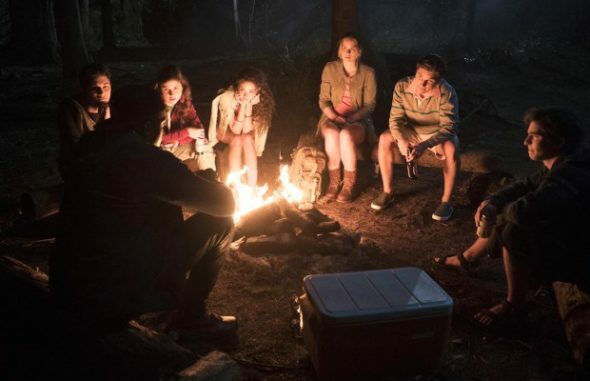 Tonight marks the conclusion of the first season of the Dead of Summer TV show on Freeform. It may also end up being the summer series’ series finale. Should this mystery series be cancelled? Could it be renewed for a second season? A supernatural horror TV show, Dead of Summer is set in the late 1980s. School is out and a seemingly idyllic Midwestern summer camp beckons. There will be plenty of firsts there — first loves, first kisses, and first kills. The cast includes Elizabeth Mitchell, Elizabeth Lail, Zelda Williams, Mark Indelicato, Alberto Frezza, Eli Goree, Ronen Rubinstein, Amber Coney, and Paulina Singer. The series debuted in late June to a disappointing 0.23 rating in the 18-49 demographic with 628,000 viewers. The numbers have dropped much lower since then. Last week’s installment drew a 0.14 in the demo with 358,000 viewers. With ratings like these, it seems unlikely that Freeform will be ordering season two but you never know. If there is a second season, word is that it would take place in the 1970s, when Deb Carpenter (Mitchell) was a camp counselor. The idea is that each season of the show would take place during a different summer. A third season could take place in the 2000’s when one of the current campers might be the camp director. But, what do you think? Would you like to see a second season of the Dead of Summer series? Or, is one season enough for you? Please renew Dead of Summer. its too amazing and interesting to give up on so quickly.Please keep it alive for the ones who love it. The show is soo great. I LOVE IT!! Please, don’t end it!!! Just found and watched the show, I LOVE it. I can’t wait for season 2!!!!!!!!!!!!! This needs to be cancelled! Cancel this terrible evil show! Seriously!!!!! Did your mom not tell you if you dont have anything nice to say thendont say anything at all!!!! Some of us really like this and would like to see it continue, it is a hell of a lot better then that reality crap!!!! PLEASE LET THERE BE A SECOND SEASON! I love this show and would be so disappointed if it ended. I think season 2 should be placed in 2016 with new actors and a new camp director!!!! That is a horrible comment!!!!! i’d love another season of Dead of Summer! it’s been an awesome bloody ride! season two is a no brainer!